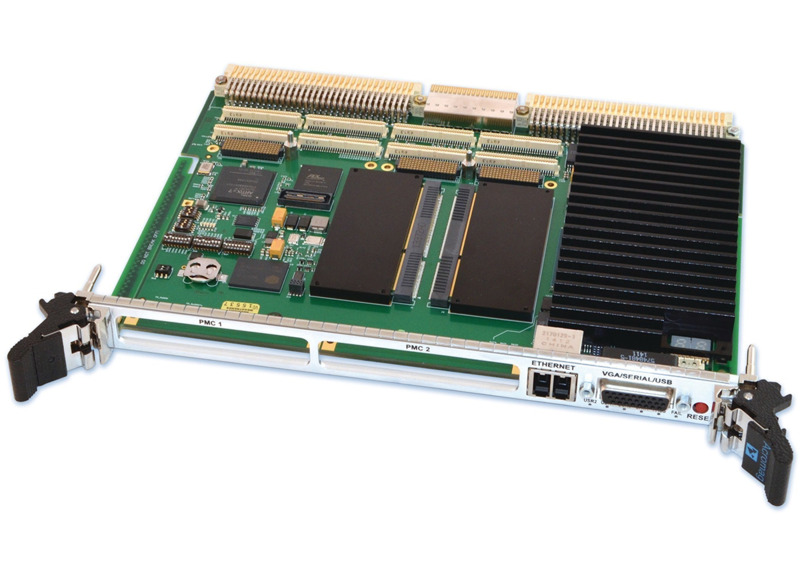 The XVME-6510 from Acromag is a high-performance 6U VME SBC based on the 4th-generation Intel Core i7 processor and uses the Intel 8-Series QM87 PCH chipset for extensive I/O support. Two ruggedized SODIMM offer up to 16 GB of high-speed DDR3L removable memory with 32 GB of flash memory. The air-cooled XVME-6510 features dual PMC/XMC sites, DVI-D display, and programmable CPU power limits for heat-sensitive applications. The XVME-6510 SBC features a FPGA-based VME-to-PCIe bridge that addresses the end-of-life issue with the TSI148 VME interface chip. The XVME-6510 also enables increased expansion capabilities through two PMC/XMC sites on the board. In lieu of one PMC/XMC module, the optional XBRD-9060 expansion I/O carrier module may be installed. The XBRD-9060 allows for two SSD mSATA drives, as well as another gigabit Ethernet port, RS-232 port, and two USB 2.0 ports. The XVME-9640 rear transition module is also available for further storage, networking, and access to the P2 connector I/O.